Six Californias: Tim Draper's terrible plan to fix California's diversity problem. What’s Worse Than One California? Try Six Californias. One rich white man’s courageous plan to fix California’s diversity problem. One California, a Silicon Valley investor has decided after careful consideration, is five Californias too few. To remedy this oversight, venture capitalist Tim Draper has gathered some 1.3 million signatures for a ballot measure that would divide the nation’s most populous state into six smaller, more manageable ones. Each, of course, would get its own governor and congressional representatives, bringing the total number of states in the union to a nice, round 55. Draper calls it the “Six Californias” plan, which cleverly makes it sound like the state would be multiplied rather than divided. If Jefferson Davis had Draper’s marketing acumen, he might have rebranded the Confederate secession as the “Two Americas” plan. And who can forget the glorious “Six Yugoslavias” initiative that made the Balkans the envy of the world in the 1990s? The goal in this case, Draper explains, is not to throw the world’s eighth-largest economy into bitter conflict and existential turmoil, but rather to smoothly and peacefully divvy up a state that has become too large and diverse to govern. How hard could that be? Admittedly, Draper’s plan is a little light on details—minor things like how to parcel out the state’s precious water, its mountainous debt, its enormous prison population, and its world-class university system. But if history teaches us anything, it’s that these sorts of questions always work themselves out one way or another. Jefferson, pop. 950,000: The northernmost of the ex-Californias, this sparsely populated territory would consist chiefly of loggers, hippies, redwoods, and weed (and Weed). Its largest city would be Redding (pop. 91,000) and its flagship university would be Chico State. If nothing else, its politicians would probably liven up the Senate a bit. North California, pop. 3.7 million: Cutting a swath from the Sonoma Coast to Lake Tahoe, this nature-kissed state would boast world-class wineries, world-class skiing, and, well, Sacramento. Oh, and it would control all the water. Central California, pop. 4.1 million: This vast state, roughly centered on Fresno, would be a poo-scented agricultural powerhouse. It would also be the poorest state in the nation. Call it the “Two Mississippis” plan. South California, pop. 10.5 million: Anchored by San Diego, this balmy state would reach from Orange County to the Mojave Desert, thus linking a cultural wasteland with an actual wasteland. Thirsty? Try a sip of the Salton Sea! Silicon Valley, pop. 6.6 million: And now we come to the real point of this exercise: to allow the Pages and Thiels and Srinivasans of the world to break free at last from the shackles of a state government that is not driven solely by the interests of the technology industry. The Technocratic Republic of Silicon Valley—comprising San Francisco, the South Bay, and the East Bay, with Big Sur thrown in for good measure—would be a humming, cash-minting bastion of innovation and liberal-tarian politics. Want to peruse Coursera while riding in the self-driving Tesla you hired on Uber and paid for in bitcoin? No one’s going to stop you here. Just don’t let anyone catch you opposing gay marriage. Silicon Valley would share a border with America’s poorest state—and would be its richest. But hey, every Palo Alto needs its East Palo Alto, right? 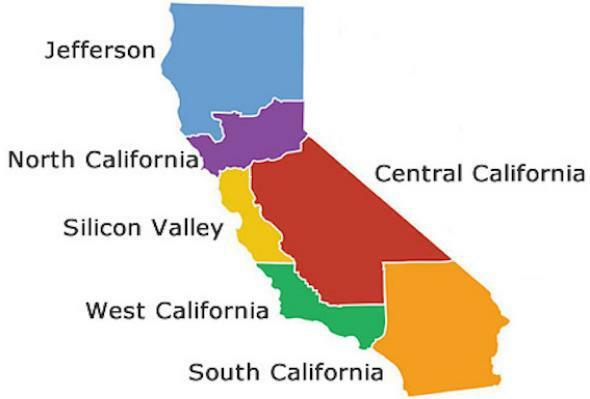 Funny thing about the Six Californias plan: Not one of these six states would actually be California—a state which, for all its flaws, is in many respects the most dynamic and influential in the country. If one didn’t know better, one might be tempted to conclude that cultural, geographical, and economic diversity aren’t such fatal handicaps after all. Thank goodness we have a rich white guy from Silicon Valley to inform us otherwise. Perhaps once he’s finished fixing California, he could get to work deciding how many socioeconomically homogeneous United Stateses to divide us into. Draper says he has gathered 1.3 million signatures, which would be more than enough to put it on the November 2016 ballot. And California requires only a majority vote to amend its Constitution—an arrangement that many suspect to be a major source of the very dysfunction that Draper is aiming to rectify. Fortunately, the scheme would also require approval from the U.S. Congress, making it exceedingly unlikely to transpire even if California voters somehow fell for it. Perhaps governmental dysfunction has its virtues after all.